Simon Fenton, Omri Katz, and others wear optical white and black high top Converse “Chuck Taylor” All Stars in the film. 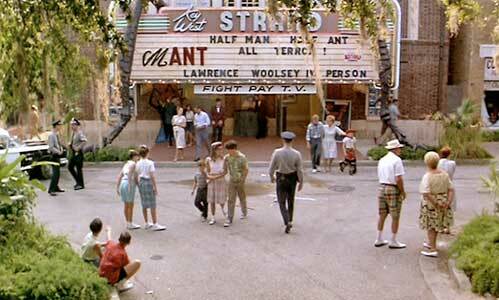 The Strand Theater in Key West, Florida is the testing ground for the new horror film “Mant”. As Matinee opens, you see scenes of nuclear destruction from an atom bomb, and after the shock of the explosions and destruction, you see that you are watching a trailer for “Mant”, a grade B horror flick, produced by Lawrence Woolsey (John Goodman) about a man who mutates into a giant ant after being exposed to radiation. Woolsey, who is a shameless promoter and hustler, patterns his film appearances after Alfred Hitchcock, complete with portly profile, and is coming to Key West, Florida to test the new special effects “Atomo-Vision” and “Rumble-Rama” he has created for “Mant”. Intercut with the coming attractions trailer, we see two brothers Gene and Dennis Loomis (Simon Fenton, Jesse Lee) watching the show in the Strand Theater in Key West. Gene, who is the older brother, takes great delight in how young Dennis is alternately intrigued and terrified by what he sees on screen. After the trailer ends, we see Gene and Dennis walking home, and learn that they are sons of a career Navy helicopter pilot, and live on the local naval base. After the two kids arrive at home, an announcement on the television tells them of a national crisis. It is November, 1962 and the Cuban missile crisis has just started with President Kennedy telling the country that he has ordered a naval blockade to prevent any more Russian ships from reaching Cuba. This is of special importance to the Loomis family because their dad is one of the military men sent to enforce the blockade. When Gene goes to school the next day, he becomes “someone” due to this fact, and we are soon introduced to the other main teenage characters in the film — Stan (Omri Katz) who strikes up a friendship with Gene, and is interested in dating the best looking girl in the school Sherry (Kellie Martin), and Sandra (Lisa Jakub) a cause-conscience girl who refuses to duck and cover during the school’s air raid drill because she considers it to be a futile exercise. Gene gets ready for bed, troubled by how events in the world are affecting his family. But the big event in town is still the arrival of Lawrence Woolsey along with his companion Ruth Corday (Cathy Moriarty) for the premiere of “Mant”. Ruth complains a lot about Woolsey’s con man behavior and cheap ways, but she is also an important part of Woolsey show business scene, playing one of the leads in “Mant” and helping him out at the premiere by posing as a nurse in the theater lobby asking the kids in the audience to sign waivers of liability in case they should die of fright during the show. Woolsey is gambling that the extra showmanship he provides will create an audience sensation and persuade Mr. Spector (Jesse White), the manager of a chain of theaters to distribute his film. Woolsey’s gimmicks include wiring the theater seats to give the audience minor electrical shocks, installing special cameras behind the theater screen to create visual effects, air blowers, extra speakers to provide loud sound effects, and hiring someone to dress up as a giant ant and run up and down the aisles to scare the audience. He also hires a couple of out of work actors to act as protestors, picketing in front of the theater and telling the locals to stay away from the film because “Mant” is an assault on America’s morals. This of course has the opposite effect, and helps persuade a large audience to attend the opening. The only one in town to realize this scam is Gene, a voracious reader of fan magazines and admirer of Woolsey, who notices that the two protesters appeared as actors in previous Woolsey films. When Gene mentions this to Woolsey, who conveniently appears during the “protest” to refute the charges, Woolsey takes him aside and confides in him, asking him to help him with his publicity campaign. Along with the story of the Mant premiere, Matinee develops some romantic subplots between the teenagers. Gene is fascinated by Sandra, and their attraction continues to develop when they run into each other at the premiere. Earlier, Stan had asked Sherry out on a date, but breaks it when he is warned off by her former boy friend, Harvey (James Villemaire), an older, somewhat psychotic delinquent. Stan ends up going to the “Mant” screening, and to his dismay is seen by Sherry, who had to take her little brother to the show. Luckily for Stan, Gene is able to smooth things over by telling Sherry that Stan is like an uncle to young Dennis, and had promised to go to the show with him first. Although back in the good graces of Sherry, Stan’s troubles continue because Harvey is the guy hired to dress up in the giant ant costume, and when he sees Stan and Sherry together, he goes ballistic. All of these threads of romance, film special effects, the Cuban missile crisis, and the hilarious “Mant” feature itself are cleverly intertwined together as Matinee builds to its climax. 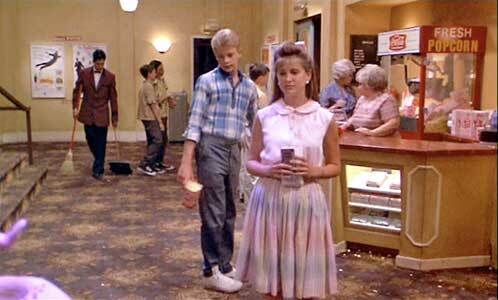 Gene smooths things over with Sherry in the theater lobby. Matinee is a tribute to the world of B horror films made in the 1950s and sixties. Director Joe Dante has put together a most enjoyable comedy that is well cast and rings true to its era. John Goodman is great as the always hustling Lawrence Woolsey, and his portrayal reminds you that the roots of Hollywood’s special effects, disaster, and horror film genre came from people like Woolsey, showmen with fly-by-night finances, big imaginations, and an understanding of how audience-based entertainment works. Jesse White (who was the original lonely Maytag repairman in television commercials) was fun to see in his role as the theater chain owner wowed by Woolsey’s old-fashioned showmanship. The various teenagers in the film ring true, because they behave like typical kids, not the all-knowing, smarter than adults types we often get in contemporary films. But the real highlight of Matinee has to be the “Mant” feature, billed as “Half Man . . . Half Ant . . . All Terror!! !”, a perfectly cheesy B horror film complete with corny dialogue filled with bad puns, hilarious special effects, and black and white cinemaphotography. This movie within the movie is performed with great enthusiasm by Moriarty, who plays the loyal girl friend to Mant as well as to Woolsey, and character actors from the sixties like William Schallert and Mark McCracken, who unfortunately are not listed in the film credits. It’s too bad that Matinee hasn’t received more hype and accolades, because it is surely a delightful and entertaining feature that everyone can appreciate. 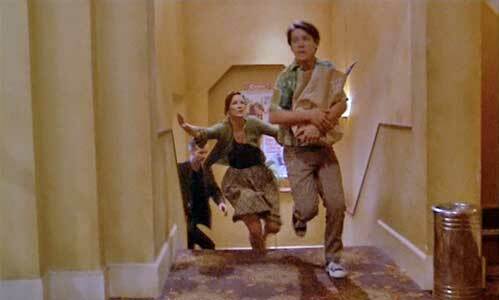 Stan rushes up the theater stairs to help his friends out. 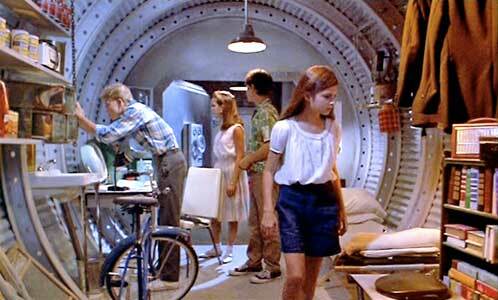 Gene, Sherry, Stan, and Sandy check out the bomb shelter in the theater basement. One of the nice visual bonuses in Matinee is all of the chucks you see worn by extras during the film, which are a constant presence in the background of the crowd scenes. 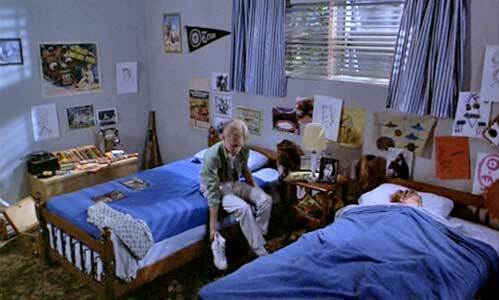 Simon Fenton in his role as Gene Loomis wears optical white high tops throughout the film, and Omri Katz, Gene’s best friend in the movie, wears black high tops. The best chucks scenes are when the main teen cast members are in the bomb shelter or trying to help out Gene and Sandy when they are accidentally locked in. 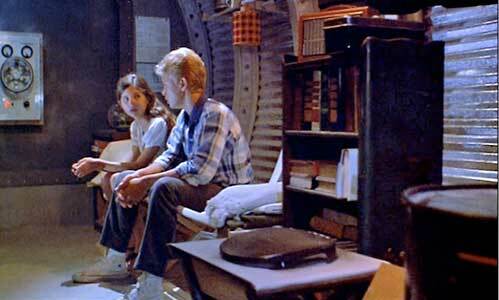 Sherry and Gene discover romance while locked in the bomb shelter. Matinee. (1993) John Goodman, Cathy Moriarty, Simon Fenton, Omri Katz, Lisa Jakub, Kellie Martin, Jesse Lee. Directed by Joe Dante.